Is the one stop shop for all your heavy and working horse requirements – from training for you and your horse, and the provision of working horse services, to the supplying of harness and equipment through our sister company Blue Horse Equine Ltd. Swainsford Heavy Horses is run by husband and wife team Richard Branscombe & Tricia Hills. 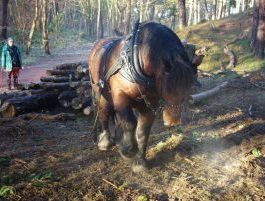 Richard has 30 years experience with working with heavy horses. Together Richard and Tricia offer the complete package, for the working horse and owner. Tricia Hills is the owner of Blue Horse Equine, a company supplying harness and equipment for the working horse. Richard has developed his own style of natural horsemanship. He uses a non-confrontational and non violent approach to training horses. 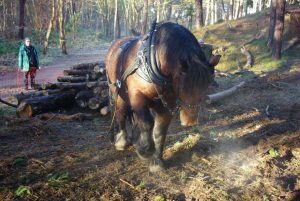 Heavy Horse experience days are an introduction into working with heavy horses and are suitable for anybody over the age of 13. Want to bring your own horse? We can run confidence building days where we train you with your horse. Enjoy a pleasurable drive around the country lanes of Wiltshire and Dorset in our purpose built passenger wagon pulled by a pair of our heavy horses. Swainsford Heavy Horses are able to give ring displays which demonstrate the use of the heavy horse in a modern environment.